SKU: TO-AL-M. Categories: Torcs, Medium Braided Torcs. The Nordic Yggdrasil was an ash tree that connected the nine worlds of Norse mythology. Now, our neck ring doesn’t have those kind of powers, but it does feature leaves inspired by those of Yggdrasil. What better way to honor that amazing tree than to wear a neck ring decorated with its leaves? 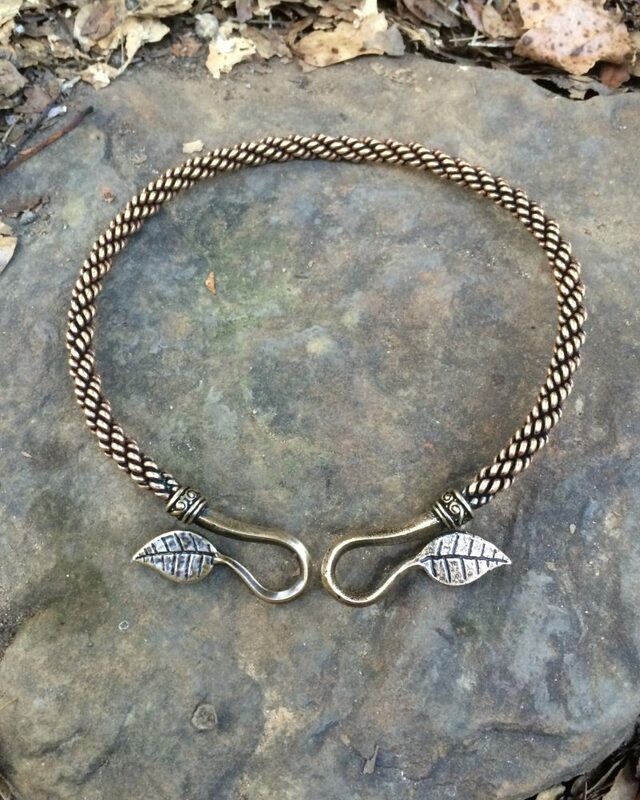 Our Ash Leaf Torc is constructed with a medium braid of wire, and is approximately 5/16” (8mm) thick. It is available in both bronze and sterling silver. The great ash tree Yggdrasil is central to Viking mythology. Also known as the World Tree, it grew on an island surrounded by the ocean, in the depths of which the World Serpent lay. This ash tree’s trunk reached up to the heavens, and its boughs spread out over all the countries of the Earth. Its roots reached down into the Underworld. A squirrel named Ratatosk ran up and down the tree carrying messages from the dragon Nidhug, gnawing at the roots, to the eagle in the canopy, and back. A deer fed on the leaves of the tree, and from its antlers flowed the great rivers of the world. A magical goat grazed by the tree, and its udders dispensed not milk but mead for the warriors in Odin’s Great Hall. And the gods held their councils under the canopy of their guardian tree.